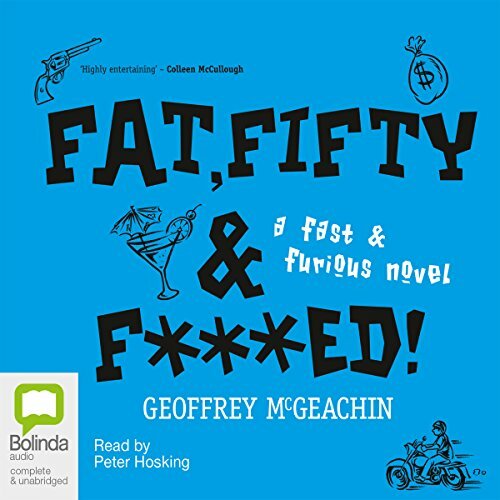 Geoffrey McGeachin didn't publish his first novel until 2004, but since the award-winning debut of Fat, Fifty, and F***ed!, McGeachin has made up for lost time, writing two complete series in the wake of his initial success. The author is like the Australian version of Carl Hiaasen, populating his novels with wit, humor, and (often) criminal action. Actor Peter Hosking has performed more than 100 audiobooks over the course of several decades. He brings his expert pacing and agility to this winner of the inaugural Australian Popular Fiction Competition. The performance is above all entertaining, taking emotionally defeated protagonist Martin Carter from 0 to 60 in a matter of seconds. Martin Carter is having a crook day. His home life's a misery, he's been retrenched by the bank, and everyone's forgotten his birthday. But a million-dollar payroll, a pistol, and a split-second decision change everything. Hurtling north on a motorcycle with the intriguing Faith, Martin encounters a mysterious hit-man, a new-age bike gang, a reclusive media mogul, and the booby-trapped mountain hideout of an old schoolmate. With Faith's help he learns about love again, along with some bitter truths about instant coffee, brown suede shoes, and the legendary Great Aussie Truck-stop Breakfast. ©2004 Geoffrey McGeachin (P)2005 Bolinda Publishing Pty Ltd. This is the perfect book for a long drive or while doing chores. It's a very funny roimp through the Australian countryside with a bank manager who has just turned fifty and decides to rob his bank branch that just closed and chuck it all. You will laugh out loud. Very enjoyable. The story did not work my brain extra hard, but I really had a good time listening to it. It was fun, funny and entertaining. This probably has something to do with turning 50 this year. What did you love best about Fat, Fifty, and Fxxxed!? Beautifully narrated story, loveable characters, brilliant one-liners. One of my favourite audible books ever. Where does Fat, Fifty, and Fxxxed! rank among all the audiobooks you’ve listened to so far? What was one of the most memorable moments of Fat, Fifty, and Fxxxed!? I quite enjoyed this book although the Narrator did sound a little bored reading it. A great light hearted story that takes you on a journey through Australia with a lot of dry humour. Peter Hosking as the reader adds a lot to the story and it is a great listen on a long drive or flight. Peter Hosking is one of the best story readers I have lisened to. Have listened to this one twice now still as good as the 1st time. What made the experience of listening to Fat, Fifty, and Fxxxed! the most enjoyable? The pacing and humor went well together. The opening scene showing why the male protagonist felt the way he did. If you could rename Fat, Fifty, and Fxxxed!, what would you call it? wild ride with enough twists and turns to keep me turning the page (metaphorically speaking). loved the aussie references. 'once those cops leave there wont be a chilko roll left for twenty miles'. The first chapter made me think "What have I purchased" but preserve as it is a funny Australian story. Fun story. Not dissing the narrator however some books cannot translate in someone elses voice. There are a lot of one liners that just do not come across right. All up, I got into it and enjoyed the characters.